Complete disclosure: I've never used a premade bath bomb. I see them everywhere and they look really nice but they always seemed too expensive for a one-time use item and too big. I mean, that whole thing is supposed to dissolve in one bath? That didn't seem right. So I thought it might be worth my while to try making some myself as a nice Valentine's gift to... myself. Obviously, I have no idea how proper bath bombs are supposed to work, but these fizz delightfully, add a very subtle tint and scent to the water, and soften my poor winter-dry legs amazingly well. So, for me, I think that's a successful bath bomb! Probably the hardest part was finding citric acid. I eventually found mine at the pharmacy counter at Superstore. It was a special order but (thankfully) I only had to wait one day for it to arrive. You can buy citric acid in varying amounts but since I didn't know how much I'd use, I started with the smallest which was a 100 g bottle. This only cost me $3 and I made about 14 bath bombs with it (this includes my testers which bombed prior to making it to a bath). Not too shabby. If you can't find citric acid, you can use cream of tartar but it doesn't have the same reaction citric acid does (it still makes the bath water nice, though). Just use half of whatever amount the citric acid was (so if you need 1 tablespoon of citric acid, you'd use 1/2 tablespoon of cream of tartar). Initially, I used an old cupcake container I had as a mould just to do some testing, but I realized I really liked the rustic/cute look it gave the bombs so I continued using it. If you were gifting these to someone special for Valentine's day, I did spot a ton of different heart-shaped containers at the dollar store that you could easily use as a mould for bath bombs. Dump the dry ingredients (baking soda, acid, cornstarch, and salts) into a bowl and whisk together to remove lumps. In a small jar, shake together the wet ingredients (oil, liquid, and colouring). While whisking, dump the wet ingredients into the dry mixture. You'll see a slight reaction (if you're using citric acid), but keep on whisking until the mixture has started to clump together and is completely dyed the colour you added. It should still be a little crumbly which is what you want. If you add any more liquid, the citric acid will start to foam and you'll end up with a pre-bombed bomb (I got a few of those and your little bath bomb will keep foaming and growing right out of your mould until it completely dries). This is a jam jar that I fancied up by painting the lid with some gold paint. I liked this storage idea the most because it has the rustic charm that matches that of the bath bombs plus it'll keep them nice and dry in the bathroom (and it was just as easy as making the bath bombs themselves!). These are perfect, and your pictures are so pretty! I like bath bombs because they smell and feel nice, but I'm the same as you, I don't want a ball the size of my head just for one bath. I think I'm definitely going to try these out! Love it, and they look so cute. They would make a great present. I've been wanting to make bath bombs for quite some time now but never got a chance. You beautiful post will be an inspiration for my weekend project! Thank you! What mold did you use? I like that the mold is small and fits into jam jars. Hi Anon! I used a cupcake clamshell. The type you'd buy store-bought cupcakes in. The bombs fit just perfectly in my particular jar, yes, though there was a little rotating to get them through the hole! What is the cornstarch used for in this recipe? Would corn flour work the same? Im struggling to find cornstarch in the UK. According to Wikipedia, corn starch is called corn flour in the U.K. As long as it's not actually just ground up corn, I believe it should work the same. Apparently, cornstarch is used to help the bombs float, but I probably don't use enough of it for that purpose. The reason I added it to my recipe was to add more substance to the citric acid in order to keep it from reacting before it got into the tub. You probably don't need to use it at all and could probably get away with just increasing the amount of baking soda or epsom salts instead. I haven't tried that myself, but I don't see why it wouldn't work out the same. The key ingredient in most bath bomb recipes is the citric acid so as long as you can find that, you're golden! Citric acid is used in dyeing fabric, so try looking for it at an upscale/specialty art store (I don't think Michaels or Joanns carries it), or you can find it cheap online at Dharma Trading Co. These are so beautiful! They sound fairly easy, I might try for bday or Christmas gifts this year! Your pictures were really nice! These look gorgeous!! I guess I am never going to oogle at the ones at Lush ever again! Thanks sooooooo much for this post! Have you made this recipe with cream of tartar instead of citric acid? Hi, Sarah! I did make this with cream of tarter (it was part of the trial recipes I did before I could track down citric acid). The only difference that I could tell is that the bath bombs don't actually "bomb" -- the fizzing effect is missing. BUT it was still a nice soak; it still seemed to me to soften the water; it was just more of a bath soak tablet than a bomb. I really (really!) didn't mind it. Because my bombs are smaller, the fizzing didn't really add that much to my enjoyment anyway. So overall, I could take or leave the citric acid. It's really up to the individual's preferences. Anon: The liquid, in this case, is anything you want it to be. It could be plain water, or, like I used, brewed tea. I was also thinking about trying this same recipe using rose water which I think could be really nice! 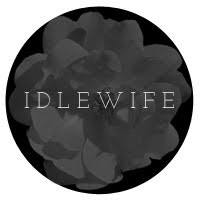 Thank you Idle Wife for putting this up! I have loved making these! They are cheap, easy, and ended up working wonderfully! One of my BFFs birthday's was coming up, and I was starting feel awful that I didn't have a whole lot of extra cash to buy some expensive spa basket. So for AT LEAST 4 hours on pinterest trying to find some things that even I could be capable of. FINALLY I found some things to do, including the bath bombs, and I just wanted to say thanks for saving my money and my hide! :) I think you have just gotten a new person to follow your blog! Hi, thank you for the post! they look fantastic, just wondering if someone can help me, should i be whisking by hand when i'm combining all the ingredients, with a hand whisk? Anon: Yes, just whisk by hand. You don't need any fancy equipment. I made these today, they were perfect in the mold but over time they PUFFED up and expanded :( any thoughts or suggestions? Barbara: This happened to me when I was first experimenting with them. It basically means that the citric acid reacted while you were mixing it up. So you might have added a little bit too much liquid. The expansion is what's supposed to happen when you add the bomb to bath water. Try adding a little less liquid, mix until just crumbly and just coming together and then pack into the moulds. Nothing's really wrong with your already reacted bath bombs. They just won't fizzle very much once in the water. Thank you! I will try again tomorrow. I used eucalyptus scented epsom salts...do you think that was the problem? Barbara: That could be the problem. If those salts are a little, um, moister? (that's an awful way to say it, but it's all I've got) than regular epsom salts, that's probably where the extra liquid came from. Citric acid is very sensitive! Yup, pretty sure it was the scented epsom salts as they were more moist. Can these be dried in a 140 degree oven for an hour or so? Barbara: You could test a few if it's really a big problem for you, but I wouldn't. Hello, I found you on pinterest. You can buy citric acid in the canning supply section in most grocery stores or big-box stores. It is used in jelly making. This is awesome,.. I think I'm going to do this for the girls Christmas gifts. Would raspberry tea work if its strong enough?? and you just add 3/4 teaspoon of that to the oil? Kaylyn: I think raspberry tea would be a really nice addition! Yes, your 3/4 of liquid would be the tea. You can mix the oil and tea together first and then add that to the dry ingredients or just dump them all together. Thank you for this idea ! I am wondering how long it will take to make this. Anon: It shouldn't take you any time at all to mix up the bath bomb ingredients. Just make sure you give them ample time to dry! A day or two would be safest! i try making it.. it look good but when put in water it does fizz... both recipe, one wit citric acid n tartar aso doesnt fizz! I'm wondering if coconut or vanilla essence would work? I;m wondering if I could substitute corn starch for potato starch? Anonymouses: I would assume that either coconut or vanilla essence would work just fine. As long as they're liquids, they should serve the same purpose as any liquid used in this recipe. I've never used potato starch, but I would assume it works the same as corn starch. The best answer I can give you is to try making a batch (the recipe is very small to begin with) and see how it works for you. Just wondering something-- your instructions say "What you'll need to make one bath bomb (or two like mine)" but your photo below shows 6 in the molds. Is the recipe for one, two or six? I'm hoping to make these for Christmas gifts! Hi Marta: The recipe can be for 1 large bath bomb (Typically, store-bought bath bombs are really big. So if you wanted to make one that was at least comparable in size to a store-bought one, you can use this recipe) OR you can also make 2 that are like mine (thinner and simpler since I don't understand why they need to be so big, as I mentioned in the post). The picture with 6 in the mould is the result of a few different batches being made, hence the difference in colours. I have to mix up a separate batch for each colour seen as you can't make more than one colour at a time with this one mix. 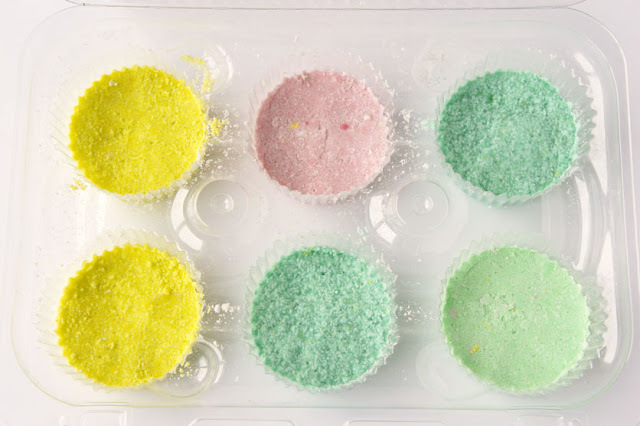 So, for example, the yellow bath bombs in the mould represent ONE entire recipe. 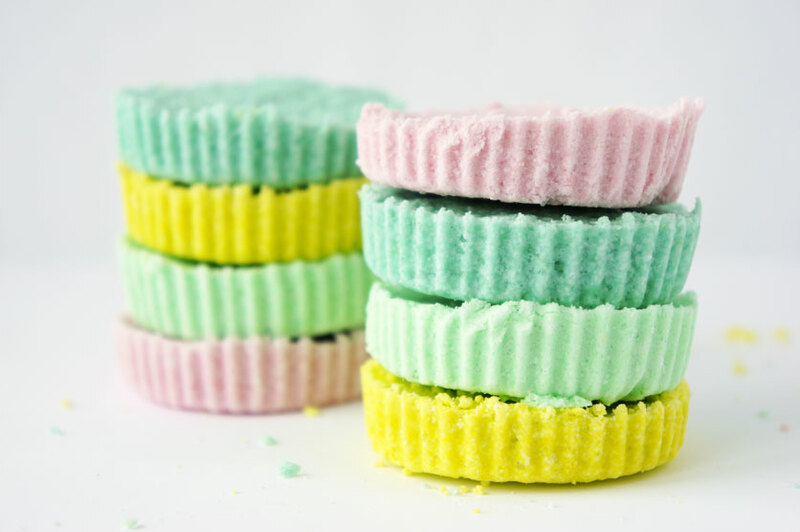 The colour variation also explains how many bath bombs this recipe makes, since in other pictures you can see that there are two of each colour (2 pink, 2 dark green, 2 light green, and 2 yellow); therefore, this recipe makes 2 thinner bombs (like the ones I made) at a time. These look amazing! I'm wondering if you could use coconut oil if you warmed it up a bit to make it liquid? Thanks! Anon: Why don't you give it a try? I would even use it as the oil component, too. Amerzon does citric acid on line. Stores in the UK don't stock very much for drug using reasons. I use it in elderflower cordial. has anyone ever found any issues with the food coloring? Will it stain the bathtub? Siobhan: Think about the amount of food colouring going into the bath bomb in relation to the water in your bath. The dilution is so high that staining shouldn't be a problem (in fact, the amount of colouring is so little, the bath water won't even change colour. The colour here is more for presentation). However, if you're really worried about it, just omit the food colouring (and maybe add a drop or two more of your liquid). 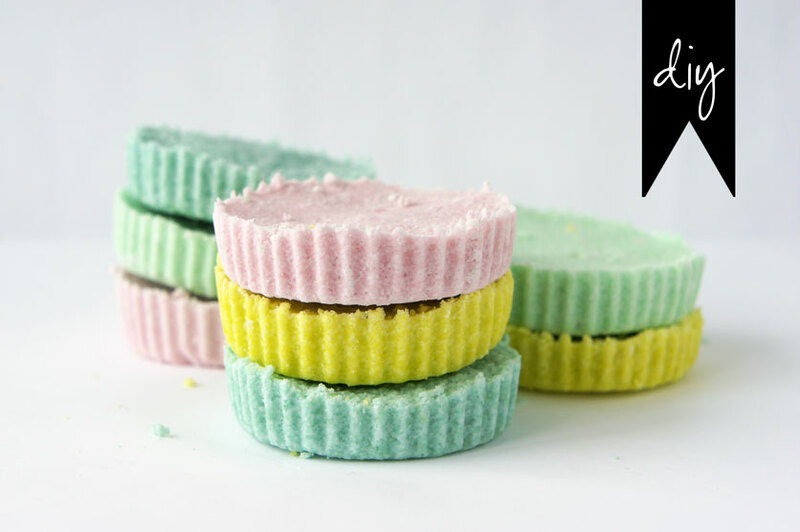 White bath bombs stacked and wrapped with a pretty coloured ribbon would be just as pretty! I had to add a few more 1/4 to get the texture right.. Do you think it will mess it up? Such a cute project! I'd like to try a batch or two for Mother's Day gifts. I'm wondering if I could try using different coffees as the liquid. Do you think that the caffeine (I don't have decaf on hand) would be bad in the tub? For the person that is. If I needed to, I could go out and buy decaf too, I guess. Michelle: I actually think there are recipes out there that use coffee grounds as a scrub for feet etc., so I think using coffee as your liquid would work just fine. I feel like the bombs would have that yummy coffee scent everyone enjoys! I've been looking for a bath-bomb recipe that doesn't use borax! Thank you! Jenna: Fresh fruit as in a puree or whole? No. That will not work. Fruit juice would work, but I'd have concerns with it. Stickiness? Rotting? I don't know. I definitely don't think it would add very much in the way of smell. Anyway, this recipe is a small enough batch that if you tested your version and it didn't work out, it wouldn't really cut into your time or supplies so just use your best judgement and have fun! Oh no no sorry didnt word that very well... the actual fruit-fresh which contains citric AND ascorbic acid? Jenna: I've never heard of or used Fruit-Fresh, but if you're thinking about using it in place of the citric acid, I don't think it'll work the same way. You can always make one batch with it and see if it foams up, but, from what I'm reading about the product, it seems to be a substitute for lemon juice to keep fruits and vegetables from browning. I don't know how it reacts on its own with water. A better test would be to put some in water and see what happens. Again, just experiment with it! That's the fun of DIY! Helen: If the bath bombs didn't foam and grow out of your moulds you should be super! Sometimes, you just gotta add a little more to get the texture right. No big deal! Hi me again haha sorry mine are a little crumbly even though theyve been drying for a day! I dont know what im doing wrong! Has this ever happened to you? I did some researching on citric acid and the fruit fresh and many sites said it shouldnt be a problem to replace it... so i dont think thats the problem! Jenna: If they're still crumbly, you probably just need to add a little more liquid to make them stay together. Yes, Jenna, liquid. Water or whatever it is you're using. Good luck! Just made these with the kids and now for the hard part...waiting for them to dry! Thanks for the recipe, I haven't used bath bombs in years - looking forward to a relaxing bath! Hi! I am using this recipe for a Christmas gift for friends and had a question. I made the bombs and followed the directions, but it didn't seem like the ingredients were proportionate. I had barely any material! I tried to double the recipe, and they came out soggy and wet after 17 hours of drying time! Please help. Afry: I can't really be sure of exactly what you did when you were making these. Maybe you mistook a teaspoon for a tablespoon? Maybe you forgot to include epsom salts? I have no idea. The recipe is also only enough to make ONE LARGE bath bomb or TWO SMALL half-sized bath bombs (as pictured). So you would have to mix multiple batches to make multiple bombs. As to the water, you really have to use your judgement. If you use too much, the citric acid will react and they won't fizz as they're supposed to. If you use too little, then, yes, the mixture will be dry. It's important to find that sweet spot where the mixture JUST comes together. I've done my best in giving you the appropriate measurements, so other than that, I don't know how much more help I can give! Hi this is so coooooooolllllll I am making them for Christmas presents thank youuuuu. Vanilla ones will be so goooood. Hi! I want to make this, but I don't have any citric acid, so I was just wondering: would lemon juice work? Even if it didn't fizz, that would be okay (although I was hoping it would), I was just wondering if you thought it would be sticky or something. And unfortunately, I don't have Epsom salt either. Is there a replacement I could use? Thanks! Hi Audrey! As I mentioned in the post, you can substitute cream of tartar for the citric acid. It won't fizz, but it does work well as a replacement (I have made them with cream of tartar). You can find it in the baking or spice aisle of most grocery stores. I don't know what could be used as a replacement for the epsom salt. 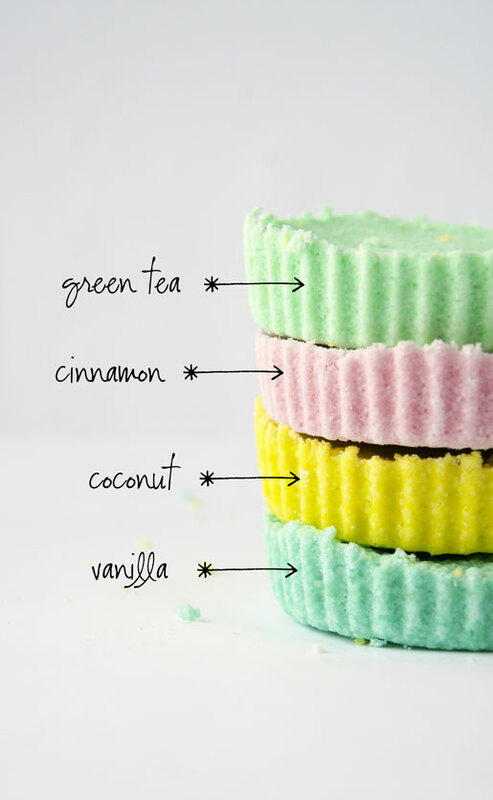 You could try adding more cornstarch instead, but I don't know what the resulting bath bomb would be like. You'd have to experiment with it. Epsom salts are really easy to find. They're in most drug stores and grocery stores, usually in the pharmacy section. Otherwise, if you're going to try to replace any ingredients try to replace equal amounts of dry ingredients with dry ingredients or wet ingredients with wet. If you added the lemon juice instead of citric acid (as suggested), the bath bomb wouldn't hold together as it would be too wet. Citric acid on its own is a powder, not a liquid. The lemon juice might work well as the liquid component, though. Lemon bath bombs! These are so cute! I was just wondering what oil you would recommend and do they stain the bath at all? Iona: As mentioned, I used canola oil, but really any oil you like would be good. My mom likes to use olive oil in her bath, so that would work nicely as well. Just remember that if you want your specific scent to really shine, you should use a lighter oil. Some olive oils are very strong! Think about the amount of food colouring going into the bath bomb in relation to the water in your bath. The dilution is so high that staining shouldn't be a problem (in fact, the amount of colouring is so little, the bath water won't even change colour. The colour here is more for presentation). However, if you're really worried about it, just omit the food colouring (and maybe add a drop or two more of your liquid). 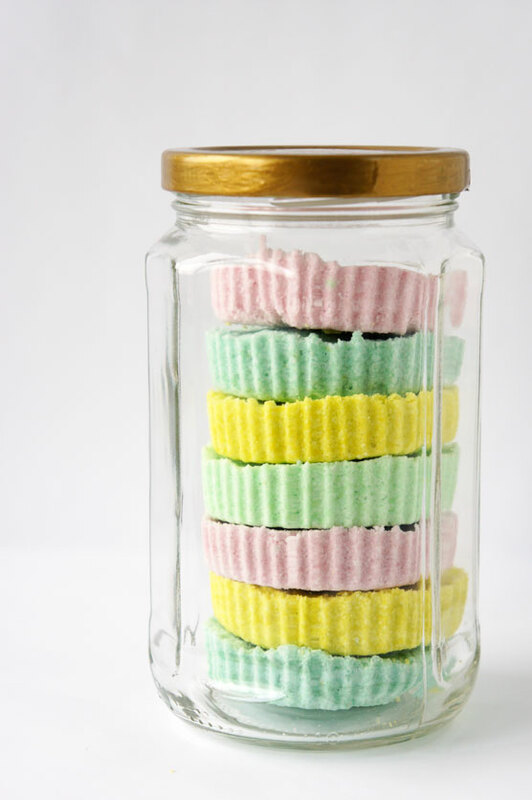 White bath bombs stacked and wrapped with a pretty coloured ribbon would be just as pretty! Jessica: I have no idea how cocoa butter would work in this case, but if you're adding lotion AND scents (which IS the liquids), then I would think the mixture would be too wet and wouldn't harden. Also I don't think it would be very nice once dissolved into bath water (consider squirting a bunch of lotion into water. Gross). Instead of adding cocoa butter lotion as the liquid, I would try adding coconut oil as the oil component instead of the lotion. Another thing to consider is that cocoa butter lotion (and oil) already has a pretty strong scent so adding more scents on top of a pretty nice coconut smell would be a little overwhelming. Despite all of that, it's a small recipe and you're free to do what you like. You can always try a test batch and see how it goes. Anyway I LOVE This idea so much and was wondering if I could make a video tutorial on it!? Of course I would give you full credit and link your blog in the description of the video! Let me know if this would be cool to do? Just put mine in molds. Is it supposed to not be cohesive and not sticking together? Kelsey: The mixture should hold its shape when you pinch it. It won't be solid yet, but it should be wet enough that it holds together easily. Once packed (and really packed, like squish it in tightly) into moulds, it'll set harder. Is there something else I can use instead of the citric acid? I can't find it anywhere in my country. horselover: as mentioned in the post, you can also use cream of tartar, it just won't fizz like citric acid does. 2)Can i use regular salt? Aisha: If you use lemon juice, you're adding more liquids and using less solids, so your bath bomb will not stick together and solidify. Citric acid and cream of tartar are both powders. If you're going to substitute, substitute liquid for liquid and solid for solid. You can easily use lemon juice as the liquid in the recipe, but you need to have either citric acid or cream of tartar. Cream of tartar can be found in the baking aisle of any grocery store and citric acid can be asked for at any pharmacy (at least here in Canada). Regular salt is not the same as epsom salts and will react differently. Plus I don't think it's that great for your skin. Epsom salts are very easy to find. They're usually in the pharmacy section of your local grocery store. You can find the citric acid in the canning section of walmart or sometimes micheals. Hello! Beautiful job! You can find citric acid basically at any grocery store--- its in a bottle by the canning supplies.. Walmart, smith's... anywhere! Super cheap. Thanks for the info, em girl and Alyssa! I found my citric acid in the pharmacy area of my local grocery store. Robat bird: I don't have it backwards, as you read above. I did state that the cream of tartar would not fizz or create any sort of typical bath bomb like reaction when placed in water, while the citric acid would. Obviously that makes the cream of tartar a lot weaker than the citric acid. Hi :) My 4yo and I made these yesterday and she couldn't wait to try them. She did have patience for her 'bath punch' ( we 'punched' them out of the mould). They fizzed and she was happy! We will totally make these again, probably tripling the batch (or making three batches) for christmas. Thank you from Australia, Rhianon and Eden. Hi can't wait to try these! What us the storage life for these? Hi Christine! I don't know what the storage life would be on these. I used mine up pretty quickly :) Just be sure to keep them safe from potential moisture and I would think they'd last a while. In case anyone is looking, I found citric acid st my local William Sonoma. Citric acid can be found with canning supplies. So cute!!! If giving them as a gift can I wrap them?